We've already established that I'm a little odd when it comes to unusual foods, right? Yesterday I was walking past a conservation area on my way home from the subway when I saw something unusual. White mulberries, growing wild, overhanging the sidewalk. I knew white mulberries existed but I had never actually seen any before. I had to have some. 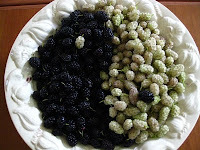 Today after I got home from work I went back to those 2 trees and picked a whole bunch of white mulberries. Once I got them home I headed up to the black mulberry tree on the corner, and picked what is likely to be my last quart of the season. 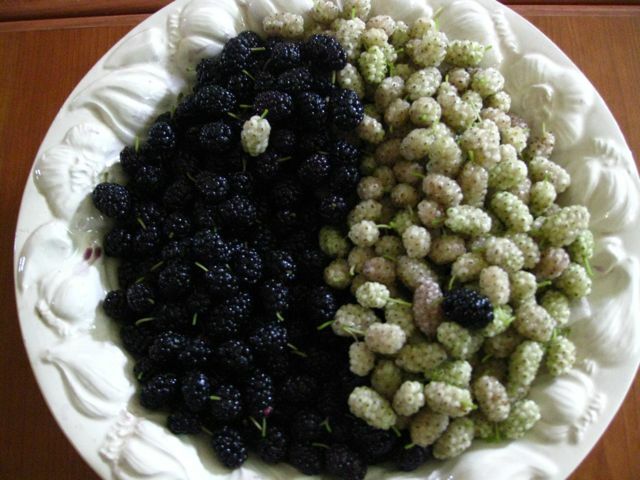 I present to you now - the yin and yang of mulberries: Yeah. I'm pretty sure I'm nuts. But I'm OK with that. If I give you my address you may send me some mulberry jelly. Ok I'm just kidding. Happy to, Dora, just send me mail! Love the yin yang photo! It made me smile!